The role of humic acids in root crosstalk signaling has been demonstrated, including modification of soil properties, plant physiology, and regulation of microbial community structure. The exudation underpins nearly all major changes that occur in the rhizosphere playing active role in the regulation of ecosystem functioning. Modifications in exudation yield or its chemical composition are a possibility for rhizosphere manipulation with beneficial outcomes for plant growth and development. We reported here the main changes occurred in exudation profile of maize seedlings induced by humic acids isolated from vermicompost. The yields of exudate were enhanced by exogenous humic acids, whereas its profile remained unaltered in comparison with non-treated plants, as shown by 1H NMR spectra. Conversely, the gas chromatography coupled to time-of-flight high resolution mass spectrometry revealed a change in the molecular distribution of exudate and, in particular, an increase in concentration of compounds related to phenyl propanoids pathway (hydroxycinnamic, cinnamic, and ferulic acid), TCA cycle (malic, succinic, citric, and aconitic acids), amino acids (homoserine, citrulline, aspartic acid), lipids (linoleic acid, caprylic acid, pimelic acid), and carbohydrates (xylolactone, tagatose, sophorose, maltose, glucose-6-phosphate, and erythritol). The increase on exudation yield induced by humic acids enhanced the release of a plethora of chemical compounds to root interface. This supports the concept that humic substances influence microbial population size and microbial community structure as well as confirms their role at root chemical interface. The biological importance of root exudation was recognized as fundamental process for mediating plant interaction with environment and other organisms . Actually, exudation has been attracting attention due to the possibility of rhizosphere manipulation for beneficial outcomes for plant–soil system . The carbon loss of the roots into soil underpins nearly all the major changes that occur in the rhizosphere . In a previous review, Jones et al. have exposed the complexity to assess and evaluate the actual rhizodeposition despite its importance in the regulation of ecosystem functioning. Furthermore, they highlighted that carbon fluxes to roots drive the exudation and, by definition, the exudates are lost passively. Therefore, the increase of metabolite levels in roots may be significant for rhizosphere accumulation. Low molecular weight organic acids, like those ordinarily exuded by plants, have a strong influence on the apparent size distribution of humic substances (HS) by stimulating plant growth through hormonal-like activities . The direct effects of HS on primary and secondary plant metabolism  as well as the behavior of humic matter in solution [6, 7] are well reported. However, the relationship between root exudation and HS has so far drawn little attention. The effect of HS on plant nutrition may be mediated by modulation of the synthesis and functionality of membrane proteins, especially the plasma membrane (PM) proton pumps (PM H+-ATPase) that build up an electrochemical proton gradient across the PM, by modulating the nutrient transport through plant cell membrane . This gradient energizes secondary active transport which is accomplished by carrier proteins via symport or antiport. The evidence of proton pumps stimulation elicited by HS was demonstrated in the late 1980s [9–13]. The stimulation of the PM H+-ATPase activity takes place in association with an up-regulation of this enzyme [14, 15]. The consequence of H+ pumping stimulation is turning the outside of the PM more positively charged than the inside. Consequently, there is a greater tendency for anionic organic solutes to be drawn across the membrane at faster rates as compared to uncharged solutes . In fact, a remarkable efflux of anionic species in the same region of proton pumping was observed through the ion-selective vibrating probe system in rice root seedlings treated with humic acids (HA) . Moreover, the enhancement of apolar sugars rhizodeposition induced by HA was elegantly demonstrated, where HS were applied in one compartment and the rhizodeposition was detected in another . 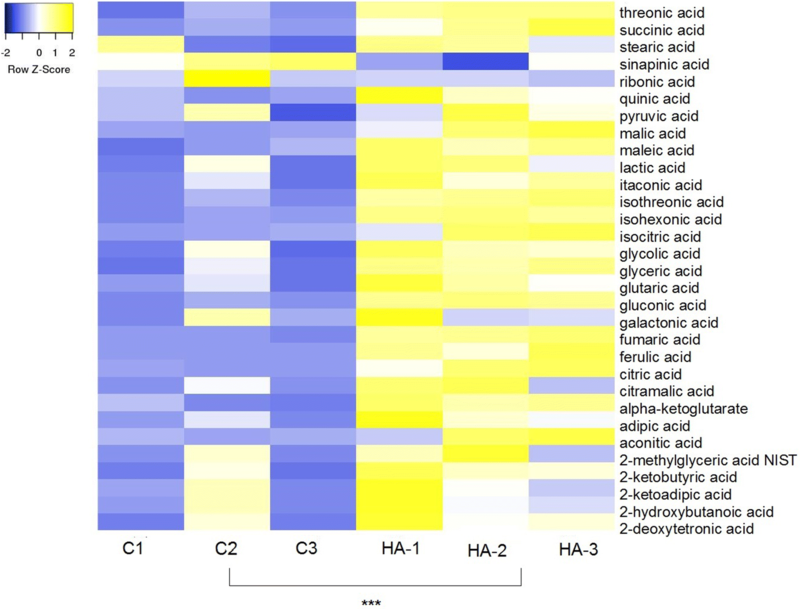 The effect of root carbon flux induced by HA on the structure of soil microbiota community was also previously reported . Finally, the main products exuded by roots include high molecular compounds like exopolysaccharides and proteins that comprise root mucilage, low molecular weight compounds, and border cells . We observed strong influence of exogenous HA in shape and number of border cells detached from maize root caps and their effects on beneficial bacteria survival and activity . Border cells are released from root tips by a controlled process and are viable and metabolically active cells . In view of this, it is plausible to attribute a putative effect of HS in plant metabolic profile and consequently in the chemical behavior of the rhizosphere. The first step to achieve is to know the exudation profile of plants treated with humic acids. The objective of this work was to build the preliminary inventory of the compounds exuded by maize root seedlings treated with humic acids. We also evaluated the level of metabolites on root tissue and compared with control plants. The exudation profile was compared by nuclear magnetic resonance of protons (1H NMR) procedure and the main compounds present in the solution trap were separated and identified by gas chromatography coupled to time-of-flight mass spectrometry (GC/TOF–MS). A solution of 0.5 M NaOH was mixed with earthworm compost (10:1, v/v) under a N2 atmosphere. After 12 h, the suspension was centrifuged at 5000×g and the HA were precipitated by adding 6 M HCl until pH 1.5. After centrifugation (5000×g) for 15 min, the sample was repeatedly washed with water up to obtain a negative test against AgNO3. Subsequently, the sample was dialyzed against deionized water using a 1000-Da cut-off membrane (Thomas Scientific, Swedesboro, NJ, USA) and lyophilized. The HA solution was prepared by solubilizing HA powder in 1 mL of 0.01 M NaOH, followed by pH adjustment to 6.5 with 0.1 M HCl. Maize seeds (Zea mays L. Dekalb 7815) were surface sterilized by soaking in 0.5% NaClO for 30 min, followed by rinsing and then soaking in water for 6 h. Afterward, the seeds were sown on wet filter paper and germinated in the dark at 28 °C. Four days after germination, six maize seedlings with root length approximately 1.0 cm were transferred into 0.5-L vessels previously filled with one-fourth-strength Furlani nutrient solution (3527 μM Ca, 2310 μM K, 855 μM Mg, 45 μM P, 587 μM S, 25 μM B, 77 μM Fe, 9.1 μMMn, 0.63 μM Cu, 0.83 μM Mo, 2.29 μM Zn, 1.74 μM Na, and 75 μM EDTA) containing a low concentration of inorganic N (100 μM [NO3− + NH4+]). These low levels of N and P were used to simulate the low availability in highly weathered tropical soils. Plants were grown in controlled environment cabinets (Sanyo; Fitotron, Loughborough, UK) illuminated with three sodium halide lamps (Powertone 250 W MHN/TD; Phillips, Eindhoven, The Netherlands) and supplemented by two 60-W tungsten filament lamps which provided 500 µmol/m2/s photosynthetically active radiation at shoot base level over a 14-h light and 10-h dark photoperiod. The cabinet was maintained at 26–27 °C. The seedlings were fixed into a perforated Teflon layer (2.0 mm thickness) with holes of 15 mm diameter in which seeds have been fitted. The system was continuously aerated by a low flux pump. The HA was applied at equivalent to 3.5 mM C/L (n = 4 pots per treatment with 18 seedlings per pot) and compared to control plants (C) grown without any humic addition. Seedlings were collected 7 days after the treatment. Four plants of each treatment were used to evaluate the root weight, whereas the remaining ones were used to collect exudate and obtain root extracts. Maize seedlings were removed from the pots and their roots were individually immersed in glass tubes filled with 50 mL of 0.5% NaClO for 2 min to sterilize and remove organic anions from the root surfaces. We then thoroughly washed the roots with tap water followed by a final rinse in distilled water. Complete root systems of two seedlings isolated from a single pot were inserted into PYREX® Folin-Wu Digestion glass tube (25 × 200 mm, Corning) filled with 40 mL of ultrapure water. The tubes were placed in a suitable rack with the solution caption protected from light. After 3 h, we collected the suspensions containing root exudates and filtered them through 0.45-μm filter membranes to remove root detritus and microbial cells. The filtered samples were freeze dried. Three exudates samples from six seedlings were joined to produce about 1 mg of dry weight that was analyzed in triplicate by GC/TOF–MS analysis. The other three exudate samples were used to evaluate the exudation yield followed by 1H NMR analysis. The root tissues of subsamples resulting from exudate collection phase were further used to obtain the root extracts. In detail, fresh roots (0.5 g per individual; n = 2 individuals) were reduced to a fine powder with liquid N2 and then extracted with 20 mL of methanol:H2O (80:20, v/v) for 30 min in an ultrasonic bath at 25 °C. The extracts were filtered at low temperature through a cellulose membrane (0.45 μm) and the solvent removed at low temperature. 1H NMR spectroscopy was conducted at 25 ± 1 °C on a 400 MHz Avance magnet (Bruker Biospin, Rheinstetten, Germany), equipped with a 5 mm Bruker Broadband Inverse (BBI) probe working at the 1H frequency of 400 MHz. Samples were prepared by dissolving 10 mg of exudates in 1 mL of deuterated water (99.8% D2O/H2O, Armar Chemicals). 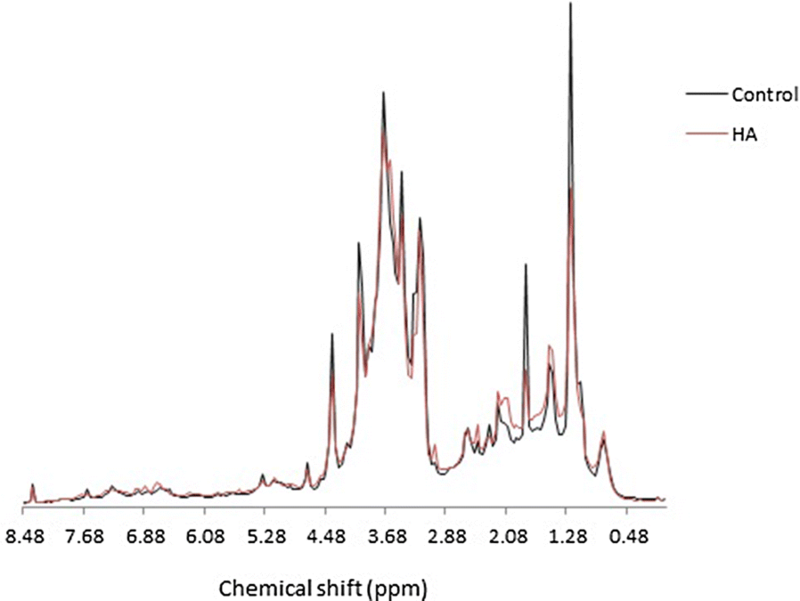 1H NMR spectra were acquired by applying an on-resonance presaturation of water signal (2 s of presaturation at 54–65 dB for power level attenuation) and setting 16 k data points, 4 dummy scans, a spectral width of 16 ppm (6410.3 Hz), and 128 scans. Spectra were processed by using Mestre-C software (v.4.8.6.0, Cambridgesoft, Cambridge, Massachusetts, USA). In particular, FIDs were transformed by applying a line broadening of 3 Hz. For GC/TOF–MS analysis, three samples of 0.8 mg of exudates or root extract were previously derivatized to enhance their volatilization. Carbonyl groups were protected by 10 μL of a solution of 20 mg/mL methoxyamine in pyridine at 30 °C for 90 min. 90 μL of MSTFA and 1% TMCS were added for trimethylsilylation of acidic protons at 37 °C for 30 min. After derivatization, 0.5 μL samples were injected in randomized sequence into a Gerstel cold injection system (Gerstel, Muehlheim, Germany) and Agilent 7890A gas chromatograph (Santa Clara, CA) in splitless mode. The system was controlled by the LecoChromaTOF software versus 2.32 (St. Joseph, MI). A 30 m long, 0.25 mm i.d. RTX 5Sil-MS column with 5% diphenyl/95% dimethyl polysiloxane film and additional 10-m integrated guard column was used (Restek, Bellefonte, PA). Injection temperature was 230 °C, the interface was set to 280 °C. Helium flow was 1 mL/min. After a delay of 5 min at 50 °C, oven temperature was increased at 20 °C/min to 330 °C, 5 min isocratic, cool down to 50 °C, and additional 5 min delay, afterwards. Liners were exchanged automatically every 10 samples. A Leco Pegasus IV time-of-flight mass spectrometer was operated at a transfer line temperature of 280 °C, ion source was adjusted at 250 °C, and − 70 V electron impact ionization. After 290-s solvent delay, filament 1 was turned on and mass spectra were acquired at mass resolving power R = 600 from m/z 85–500 at 17 spectra per second and 1550 V detector voltage without turning on the mass defect option. Recording ended after 1200 s. The instrument performed auto-tuning for mass calibration using perfluorotributylamine before starting analysis sequences. Quantification was reported as peak height using the unique ion as default, unless a different quantification ion was manually set in the BinBase administration software Bellerophon. Metabolites were unambiguously assigned by the BinBase identifier numbers, using retention index and mass spectrum as the two most important identification criteria. All database entries in BinBase were matched against the mass spectral library of 1200 authentic metabolite spectra and the NIST05 commercial library. A quantification report table was produced for all database entries that were positively detected in more than 50% of the samples. The analysis was carried out at Genoma Center from University of California, Davis. The concentration map (heat map of the scaled concentration) was built by using the heat mapper program of Babicki et al. after analysis of variance. The significance of treatment-depending differences among the compounds identified by GC/MS–TOF was assessed via one-way variance analysis (ANOVA) (three repetitions per treatment). The means (absolute values) were compared by using Dunnett’s post hoc test against the control at a significance α level of 5%. Metabolite levels detected in both extracts and exudates were normalized to the mean response of control. Response ratios correspond to the level in a given treatment divided by the level in the control. The metabolic profile of exudates and root extracts were further analyzed in an additional experiment in order to observe possible changes induced by HA in the dynamics of root exudation. Seeds of maize (var. DBK 7815) were surface sterilized by soaking in 0.5% NaClO for 30 min, rinsed and soaked in water for 6 h. Maize seedlings were grown for 7 days either with or without the addition of 3.5 mM HA. In all cases, the root systems were washed by 0.5% NaClO, rinsed with water, immersed into glass tube filled with 50 mL ultrapure water and sealed with a Teflon layer (2.5 mm thickness) perforated in two points for plant insertion. The empty area included within the maize stem and the Teflon layer was recovered with a parafilm layer to hold the seedlings. A 20 mL syringe was stuck across the Teflon layer to collect 10 mL aliquots for the measurement of 14C activity in each of the 30-min fractions until 6 h after the end of 14CO2 pulse. The 14CO2 pulse was done 1 h after the seedlings in the trap for 30 min using NaH14CO3 solution (3.4 MBq total 14C activity) from a pump to an excess of lactic acid. Measurements of 14C activity on the capture solution (water ultrapure grade) were determined by liquid scintillation counting (TRI-CARB, PerkinElmer, Waltham, US) using OptiphaseHiSafe 2 scintillation fluid (PerkinElmer, Waltham, US) and a count time of 5 min. HA significantly increased root growth and exudate yield (Fig. 1). The root and shoot dry weights were 91% and 34% higher with respect to control plants, respectively (Fig. 1a, b), while the exudate yield per plant was around 71% greater in comparison with control plants (Fig. 1c). Larger plants produce more exudates as a direct consequence of primary metabolism stimulation and biomass increase. The dynamics of exudate deposition on trap solution was practically the same in both treatments with larger deposition at 2 h after the 14C pulse (Fig. 1d). In the HA treatment, it was possible to note an additional shoulder of rhizodeposition in the interval between 3.5 and 4 h. However, being this result based only a single test (no replicates), we cannot discriminate whether this effect is significant and results from the HA effect on the dynamic of exudation, or is simply attributable to a deviation due to experimental error. Notwithstanding, the quantitative experiment was repeated three times independently and the higher peak of exudation at 2 h in the trap solution was compatible with larger exudate production in maize root seedlings treated with HA (Fig. 1c). The 1H NMR spectra of exudates are shown in Fig. 2. In terms of H species, no significant differences were observed between treated and non-treated plant exudates. The spectrum includes three regions at the chemical shifts ranges of 6–8.5, 5–6, 3–5, and 0.8–3 ppm. Several signals in the high-field region were detected in both exudates types. In particular, the resonance at 0.8 ppm indicates the methyl groups of aliphatic chains composed at least by three carbons. The resonances included within 1.15 and 1.7 ppm are generally attributable to aliphatic groups. Specifically, the intense signal at 1.15 is ascribable to the superimposition of methylene protons in aliphatic chains. The sharp signal at 1.8 ppm appears to be a singlet and thus may arise from methyl groups α to unsaturated groups. The region ranging within 1.8–2.5 ppm comprises (CHn)– protons bond to electron-withdrawing groups (i.e., carboxyls, aromatic structures). The signals resonating in the region included within 3 and 5.4 ppm are mostly attributable to hydroxyalkyl groups, prevalently deriving from carbohydrates. In particular, the signal at around 5.3 ppm is ascribable to hydrogens bond to anomeric carbons in mono- and oligosaccharides. Finally, the signals in the range 5.5–8 ppm are ascribable to protons bond to sp2 hybridized carbons, including simple unsaturations (5.6–6.5 ppm) and aromatic structures (6.6–8 ppm). 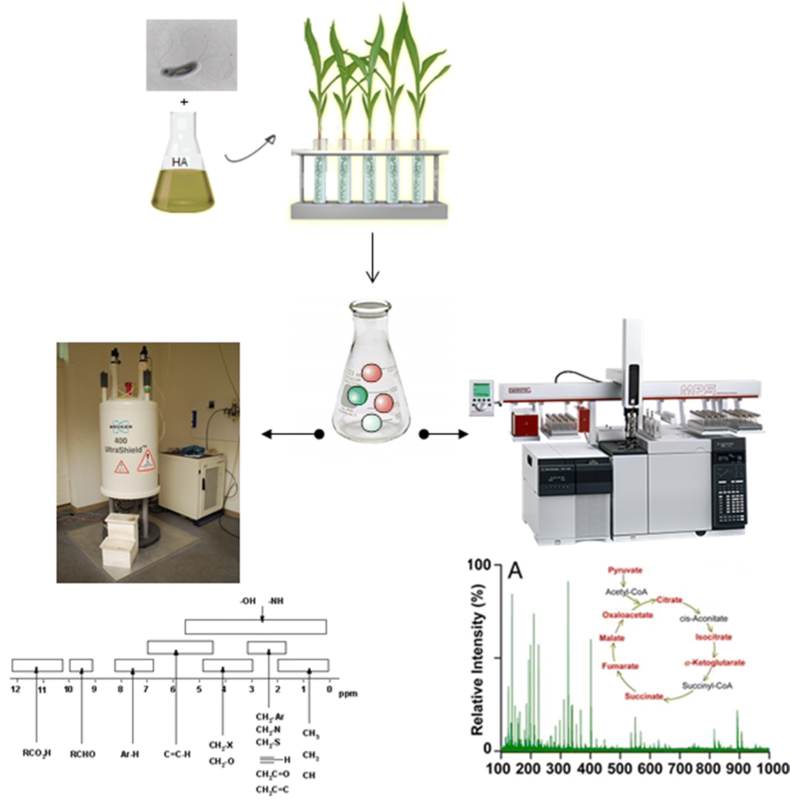 Form a general point of view, the comparison between the proton spectra of exudates from maize seedlings roots treated with or without humic acids did not reveal relevant differences. GC/TOF–MS permitted to detect a total of 464 metabolites. By comparison with a MS library, 170 compounds were identified in both root extracts and exudates. Although HA treatment did not change the specific exudation rate (mg/g dry root/min), they induced maize root seedlings to produce a greater amount of exudates. This is compatible with the increase of root growth (Fig. 1a) and the increase in intensity of H signals observed in NMR experiment (Fig. 2b). Figures 3, 4, 5, and 6 show the concentration maps of the exudates which permit to readily highlight the differences between the control and HA-treated plants. The related values are presented in Tables 1, 2, 3, and 4. Table 1 shows 37 metabolites deriving from the carbohydrates metabolism. HA caused significant changes in the response ratios of 7 and 30 metabolites in the root extracts and the exudates, respectively. The main effect of the HA treatment on carbohydrate composition of root extracts was the decrease in the level of metabolites with respect to control. In particular, 20 sugars (including xylolactone, tagatose, sophorose, galactopyranoside, glucose-6-P, galactose, and erythritol) were exuded in a larger amount (> fourfold) for plants treated with HA. The level of most of organic acids in the root extract obtained from plants treated with HA was smaller than control samples (Table 1) similar to that found in carbohydrate profile. In the root extracts of maize seedlings treated with HA, a larger decrease in acid lactic level along with an increase in alpha-ketoglutarate was observed. The qualitative changes observed in organic acids exudation (Table 1) were similar to those observed for sugars. HA-treated samples showed a larger level of organic acids on exudate extracts with respect to control (23 out of 27 identified organic acids), and, in particular, succinic, mucic, malic, lactic, isocitric, glyceric, gluconic, citric, citramalic, and aconitic acid. The results concerning the amino acids levels are shown in Table 2. The root extract of seedlings treated with HA showed a weak, though significant, decrease in 8 amino acids. However, despite the low amino acid level found in root extract of HA-treated seedlings, the exudation of amino acids was large. In fact, 16 amino acids were found in highly significant level with respect to control, especially citrulline (> 23-fold), homoserine (> 14-fold), aspartic acid (> eightfold), histidine (> sevenfold), oxoproline (> fivefold), lysine (> 4.6-fold) as well as hydroxynorvaline, alanine-alanine, methionine sulfoxide, tryptophan, threonine, thymidine, and valine (Table 2). The compounds linked to nitrogen metabolism other than amino acids are also shown in Table 2. The root extracts obtained from plants treated with HA showed 8 compounds whose content was significantly smaller than control. The exudation profile of HA-treated samples revealed 13 nitrogenous compounds whose levels increased significantly, such as uridine (> sixfold), N-acetylputrescine (> 17-fold), N-acetyl-d-hexosamine (> fourfold), aminomalonate (> 16-fold), adenine (> sevenfold), and allantoic acid (> eightfold). The changes in lipid compounds on root extracts of HA-treated plants can be seen in Table 3. The root extract from HA-treated seedlings presented smaller significant levels for 11 compounds with the largest decrease in oleic acid, d-erythro-sphingosine, and 2-ketoadipic acid. Only one lipid (lignogliceric acid) showed HA-induced levels greater than control. 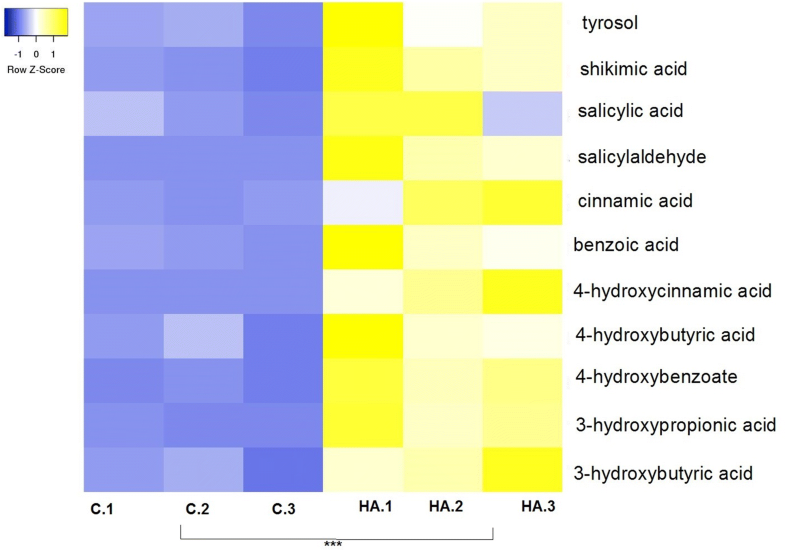 However, in case of exudates, 14 out of 15 lipids were more abundant than control, thus indicating that HA induced an enrichment in exudates of low water-soluble compounds. Linoleic (> eightfold), isohexonic (> sevenfold), caprylic (> sevenfold), pimelic (> 5.6-fold), 2-ketoadipic (> fivefold), and adipic acids (> fourfold) were found in larger levels in HA-treated samples, except for oleic acid which was less abundant than control. Although the type of analysis used here permitted mostly to focus on the primary metabolism (according to the identification performed on the basis of BinBase library), changes in secondary metabolites levels were also observed. Some compounds from phenyl propanoids pathway, generically called here as aromatics, are shown in Table 4. The aromatic profile in exudates from HA-treated plants significantly changed. In particular, larger levels of 4-hydroxycinnamic acid (> 114-fold), cinnamic acid (> 35-fold), ferulic acid (> 19-fold), shikimic acid (> 9-fold), quinic acid (> sixfold), and 4-hydroxybenzoate (> fivefold) were detected. Finally, myo-inositol (> fourfold) and methanol phosphate (> 46-fold) were also more abundant in exudates from HA-treated plants (Table 4). The root growth promotion induced by HA (Fig. 1a, b) was followed by changes in the amount of root exudates from maize seedlings grown in hydroponics (Fig. 1c). More than 400 metabolites were resolved and around 40% of total metabolites were identified by unbiased GC/TOF–MS analysis. 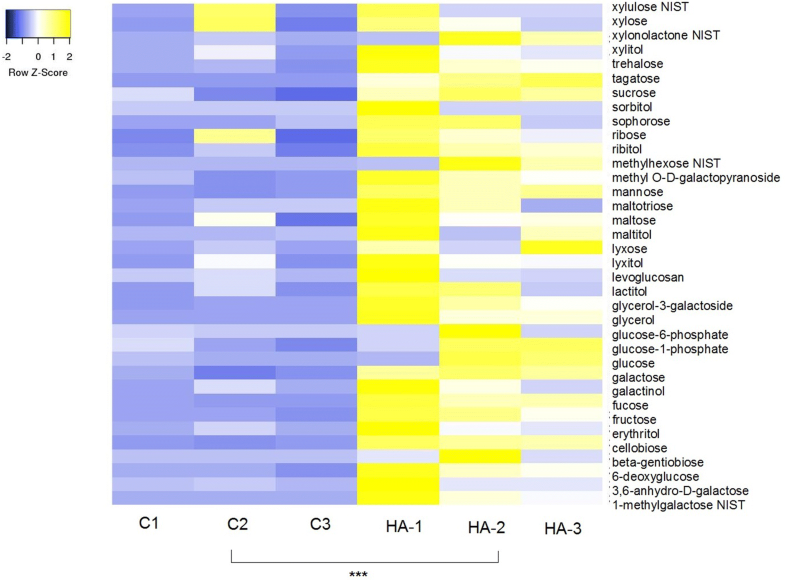 The HA treatment changed significantly the levels of 170 identified metabolites in both root extracts and exudates (Tables 1, 2, 3, and 4). We can generally infer that, as compared to the control, HA promoted a significant decrease of specific metabolites in root extracts, which, in turn, resulted more abundant in the corresponding exudates. From a general point of view, GC/TOF–MS results indicated that HA treatment elicited a significant boost of compounds released in the exudates which were then isolated in the trap solution. At the same time, the concentration of these compounds decreased in the root tissues, thus suggesting a tight correlation between each other. We concentrated on the description of results on compounds identified in both extracts (roots and exudates) and in both treatments (HA and control) since the 1H NMR spectra were essentially the same in both exudates (Fig. 2). We are aware that the methodological approach used here (solution trap to capture exudates) may be limited and therefore we avoid to over-interpret data, especially in light of the importance of exudation at ecosystem level. However, the analytical results reported here may represent a first step to improve knowledge on the influence exerted by soluble HA on root exudations. The first question to address is that, by definition, the exudation is a passive movement according to the concentration gradient (i.e., it is necessary the enhance compounds levels in roots to drive the efflux toward the capture solution). It was previously demonstrated that carbon flow to the rhizosphere is a direct function of root growth  and its enhancement is accompanied by an increase in root weight, as observed for HA-treated seedlings (Fig. 1). The question yet unanswered is whether the low concentration observed for metabolites in roots of treated plants may be considered as a consequence of larger exudation flux. This assumption is supported by two evidence observed previously and consisting in (i) a greater release of border cells to hydroponics in maize seedlings treated with HA , and (ii) the well-described effect of HA on proton pumps activity [14, 15]. Moreover, according to the review of Farrar et al. , the border cell-mucilage capsule sheaths the root tip, modulates the chemistry of the extracellular environment, and may define the ecology of the incipient rhizosphere as it forms. In addition, the root cap is a primary site of signal perception leading to root response to environmental signs. As both the root system and border cell production are strongly influenced by HA, a greater exudation is expected. Moreover, the efflux of negatively charged solutes is directly regulated via the driving force for transport, that is the plasma membrane electrochemical potential gradient . Due to the direction of the charge gradient across the membrane created by the plasma membrane H+-ATPase, influx of anions by passive diffusion is so small that net C loss is essentially a unidirectional efflux. We observed this behavior following the H+ efflux in rice seedlings treated with HA through the ion-selective vibrating probe system, that permitted to observe an astonishing efflux of anions (net negative charged) in correspondence with the root surface developing the H+ efflux . However, it remains to be seen whether non-specific cellular transporters can be activated by HA and can contribute to this large production of exudates. Despite our awareness that the direct projection to natural conditions of results extrapolated from artificial experiments, must be done with care and caution, the greater exudation observed in HA-treated plants represents an interesting result whose consequences may be highly relevant. The effect of HA on plant physiology is generally recognized to result in root growth enhancement associated to a larger exudation (Fig. 1). The efflux of organic compounds to rhizosphere may have direct consequences to (i) microbial activity, (ii) nutrient availability, and (iii) organic matter stability. 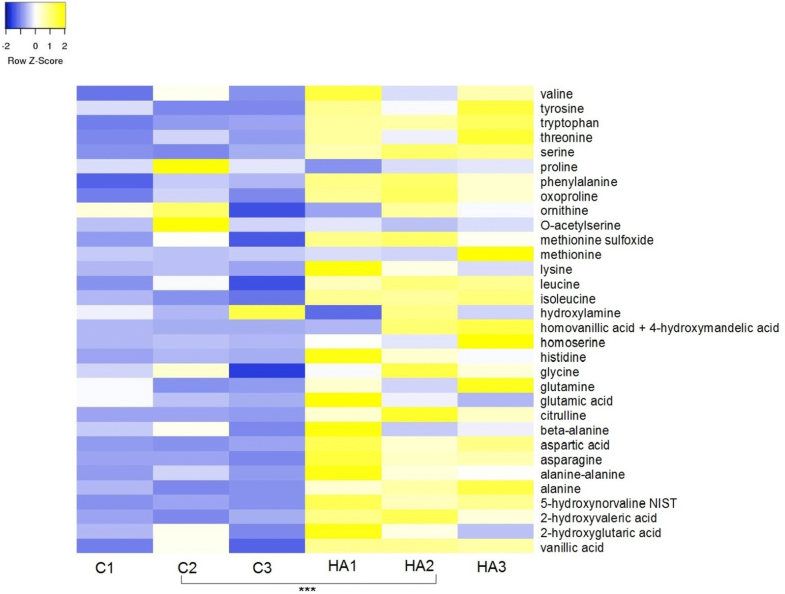 Changes on microbial (especially bacteria) community structure of rhizosphere corresponding to plants treated with HA were previously reported [17, 18, 22]. Part of the numerous compounds exuded by root seedlings may have a suppressive effect, as well as other compounds, such as sugars and organic acids, may serve as readily available source to energy. The phenylpropanoid derivatives (including the aromatic species listed in Table 4) have a strong antibiotic activity (shikimic, cinnamic, benzoic, 4-hydroxycinnamic, vanillic and ferulic acids) and were found in larger concentration on trap solution from seedlings treated with HA. Aminomalonate, for example, which is a precursor of stilbene synthesis and is recognized as an antibiotic capable to influence microorganism selection, was exuded in larger amount by seedlings treated with HA. The HA-induced changes on microbial structure observed previously may result from a balance between readily available and suppressive compounds which ultimately drives the niche composition and the ecological succession at root surface. The role of organic acids on plant nutrients is well described  including the chelation mechanisms of trace nutrients [23, 24]. The relatively large amount of different exudates may promote the solubilization of humic molecules in the rhizosphere , although the magnitude of this contribution is difficult to estimate. Despite the objective limits due to the artificial exudate capture system used here, the large statistical difference between treated and untreated plants cannot be neglected and indicates a greater exudation further representing an indirect source of nutrients. Previous works  have shown how plants may absorb amino acids from exudation produced by roots, thus putting the light on another side of the issue which involves the organic nutrition. It is further remarkable the fact that the exudates can be stabilized and protected against microbial degradation through the presence of humic substances which perform a molecular trapping through the involvement of hydrophobic domains . In this context, some bioactive molecules can be trapped in the humic aggregates, which in turn can be disrupted by high amount of organic acids exudates by roots (Table 2). A specific data discussion may arise by considering the categories of identified compounds. Glucose-6-phosphate and fructose-6-phosphate (i.e., compounds of first steps of glycolysis and source of blocks to pentose phosphate pathway) were more abundant after HA treatment (Table 1), thus revealing a boost on carbohydrate metabolism, as confirmed by the huge amount of aconitic acid. Previously, we reported a significant decrease in the total content of carbohydrates present in leaf extracts from maize seedlings treated with HA . Classical biochemistry assays indicated that free carbohydrate content in leaf extracts was smaller after the humic treatment. In addition, glucose and fructose contents were significantly greater (> 10- and > 12-fold, respectively) for control plants, while the starch content was enhanced in treated plants, as observed in this study by its derivatives such as maltose and maltotriose. It is well reported that HS can induce carbon and nitrogen metabolism by indirectly increasing the activity of enzymes involved in glycolysis, the Krebs’s cycle, and N assimilation . On the other hand, Nardi et al. have reported that HS can inhibit the activity of glucokinase, phosphoglucose isomerase, aldolase, and pyruvate kinase, enzymes involved in glucose metabolism. Moreover, the HA-induced inhibition of genes related to overall sugar metabolism has been previously verified . Furthermore, it is possible that part of carbohydrates, which were found less abundant in root extracts, had been exploited for the amino acids synthesis. In fact, it was observed in HA exudates a noticeable enhancement of the level of organic acids from TCA cycle and, in particular, of isocitric and aconitic acids (Table 1). The HA treatment enhances the synthesis of glutamine and related amino acids, such as proline and arginine. The effect of HA on the enhancement of nitrate reductase (NR) activity was previously verified. However, the activity was smaller than that found in leaf extracts . In this previous study, using classical biochemical approach, GS (glutamine synthetase) activity was significantly induced by HA more than in control. The proline and oxoproline concentrations were larger in treated plants, and the role of these amino acids in cell osmoregulation is well documented. The increase of citrulline as a consequence of biotic stress was previously reported , as well as the necessary stimulation on glutamine synthesis for increase of urea cycle activity. Less abundant amino acids than in control were found in root tissues of HA-treated samples. The first proteomic analysis conducted on maize seedlings treated with humic substances showed a surprising inhibiting effect on most of membrane proteins . These results were in line with the low amino acids content detected in root extract of HA-treated samples reported in this work (Table 2). The treatment with HA had a small effect on the exudation of products related to nitrogen metabolism. However, the nucleotides adenosine and thymine were exuded in a larger amount than control (Table 2), along with other nitrogenous compounds related to metabolism of nucleosides (such as pseudouridine and uric acid) (Table 2). The enhancement of glutamine pathway in the exudates from treated seedlings is compatible with significant increase of aminobutyric acid (GABA) and its intermediary product (i.e., butyrolactam was fourfolds more abundant). Some stresses are recognized to induce a rapid increase in the cellular levels of Ca2+. Increased cytosolic Ca2+ can stimulate calmodulin-dependent glutamate decarboxylase activity and GABA synthesis (usually serving as stress marker) . It was previously observed a pulse of Ca2+ uptake in rice seedlings treated with HA, accompanied by the increase of CDPK (calcium-dependent kinase protein) responsible to signaling cascade (stress) response . In general, the HA treatment led to a lower content of lipids compounds into root extracts which was accompanied by a larger abundance of compounds related to the phenyl propanoids pathway, such as shikimic and cinammic acids. Also quinic acid was found in larger concentration in the root exudates. This molecule derives from chlorogenic acid and belongs to the family of hydroxycinnamic acids (i.e., compounds produced largely by plants in case of biotic or abiotic stress). The presence of tyrosol (phenolic glycoside) in HA samples further corroborates the HA-induced increase on phenyl propanoids pathway . Generally, the HA-induced decrease in the concentration of carbohydrates, organic acids, amino acids, lipids, and aromatic compounds in the root extract, contrasts with the significantly larger concentration of most of identified compounds in exudates. It is possible to postulate that a lower level of compounds in root extracts is a consequence of metabolic boost induced by HA treatment which produces a larger exudation as a response to a “humic signal.” The enhancement of sugars and organic acids in exudates of maize seedlings treated with humic substances was previously reported [17, 34] and can be related to a modulation of microbial community . We have stated that HA induced an increase in the exudation yields. However, we cannot exclude completely that part of compounds that we assigned here as components of exudates derived from humic substances. In fact, we must account for this hypothesis although we carefully disinfected the root’s surface and desorbed organic compounds by washing with 0.5% NaClO. Generally, the observed response can be depicted as a stress-like response induced by HA with a concomitant enhancement of exudation. The HA-induced enhancement of aromatic, nitrogenous, and lipid exudation was previously reported . These authors employed the same trap used here for the capture of exudate, even if they examined the resulting solution only through a chromatography based on a hydrophobic column. This enabled the retention/detection of apolar molecules preventing the evaluation of polar compounds, such as sugars, organic acids, and amino acids . Here, we applied a protocol designed to isolate primary plant metabolites and identify them through the BinBaseLibrary. Despite different protocols, our results are in agreement with part of outcomes reported in this study . The products of nucleotide metabolism, such as ribonic and uric acids, were exuded in a significant level by HA as well as the amino acids tyrosine, glutamic, and glyceric acids. Finally, the carbohydrates sucrose, maltotriose, and maltose were found in significant level in exudate of HA-treated samples, thus showing the occurred boost on primary metabolism. The development of analytical tools and techniques occurred in the last decades has gradually permitted to improve the knowledge on the physiological effects induced by humic acids in plants. The 1980s were marked by a relatively large body of publications reporting on the effects of humic substances on enzyme activities and based on a classical biochemical approach. In the late 1990s, it was identified the role played by naturally occurring organic acids on the structure of humic substances along with the achievement of new information on humic nature/conformation. These progresses have been decisive for the current understanding of what humic substances are and how humic substances influence directly the plants. More recently, the research studies on proteomic and differential gene expression have provided new insights into the humic-elicited gene modulation. In this work, we have reported the principal compounds exuded by maize roots seedlings and evaluated the effects of humic acids exerted on these processes. By summarizing, we did not observe any significant change on exudation profile, except for the yield which in turn increased. Many of the exuded molecules play key roles in regulating the complex relationships among roots and environment. In particular, they may provide chemical defenses against competing animals and microbes thus favoring the symbiosis with plant growth promoting bacteria . The rhizosphere represents perhaps the last unknown frontier of the plant–soil–microorganisms conversation. It was possible to see clearly that HA changed relevantly only the yields of exudate compounds. As the qualitative profile and dynamics of exudation remain constant, the results indicate that it is a consequence of the metabolic boost provided by humic acids. Finally, as the exudation was previously described as a result of a passive diffusion (i.e., the high concentration of cytosol drives the flux to rhizosphere), the unexpected low concentration of metabolite levels into the root tissues from seedlings treated with HA indicates that non-specific carriers can be activated. This opens a new window for future research to be acquired. FLO and AP contributed to experimental idea, discussed the data, and reviewed the manuscript. NOA was responsible for the statistical analysis; PM conducted and interpreted the NMR spectra. LPC conceived the project and carried out the experiments and wrote the manuscript draft. All authors contributed to interpretation of the results and writing of the final paper. All authors read and approved the final manuscript. Thanks are due to Prof. D. Jones from Environment Center of Wales for providing the funds to support the CG/TOF–MS analysis. The stage of LPC at Environmental Center Wales was possible due CNPq “Science without Border Program” (process 232183/2014-7). The Additional experiment was supported by FAPERJ, Cientista do Nosso Estado program. The NMR analysis was done at CERMANU-Italy.